Happily, one of our favorite BBC Radio 4 programs, In Our Time, is back on the air after a summer hiatus. 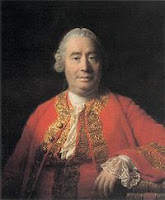 The most recent program was a discussion of Scottish philosopher, David Hume. David Hume (1711-1776) was one of the most influential philosophers of the Enlightenment period in western intellectual history. This was the time when empiricists like Galileo and Isaac Newton and Robert Boyle, among many others, and philosophers like Descartes, Francis Bacon, and (again) many others began to reject various philosophies of life and knowledge that had persisted essentially since the classic Greek philsophers. The new view was empiricism. Whatever the truth of the world is, the only way to know it is by observations. Our brains were not ordained, as philosophers had suggested in the past, by their creator with some inherent sense of world-truth. That truth might be confirmed or elaborated by experience, but we could reason out the truth in many ways simply because our brains were built to be consistent with it or to understand it. We're oversimplifying, of course, but ideas of scripturally revealed, or organically a priori means of knowledge were commonplace for millennia in western culture. These views were known in various ways, but are captured by the term 'rationalism', meaning that we can reason out the truth without observing it. It was quite a revolution in thought to suggest, as Hume and others did, that knowledge came only from observation first. Debate concerned the role of reasoning about observations, but basically the idea of induction was at the core of the idea that the world must tell us, by its consistency and pattern, how it works. Science might devise 'laws' to explain these regularities of observations, but essentially only to give reasons why we consistently see effects always follow from presumed causes. These ideas became the core of the so-called scientific method, by which we reduce outcomes to their individual causal elements, assuming causes can be studied in isolation. We cling to this idea, teach it, and lobby for it all the time, even though it has many fundamental problems. The idea is that we have a theory of our field, say of biology or physics or chemistry, and it is against that theory that we evaluate evidence to understand particular observations or make predictions about future events by using the theory to go beyond the specifics of past experience. That is the assumed, often unquestioned, basis of modern science. We know that our theories can be wrong, as scientific 'revolutions' have periodically shown. That should make us much more humble about our current views than we are, and Thomas Kuhn's famous analysis of scientific 'revolutions' asserted, reasonably accurately, that we cling to our current theory (he called it the 'paradigm') as if it were (so to speak) the God's truth, until forced to think otherwise. However, Hume himself was in essence more skeptical as to whether we can ever know truth. We can only work from our history of observations, and the explanations ('paradigm' or 'theory' or 'laws') that we currently accept. But these are limited to our sensory systems and experience to date, and we have absolutely no way of knowing whether we are interpreting causation correctly (or even the idea that there is causation as we think of it). Such debates are more important than just as a source of employment for philosophers (and the fact that they make far less money than scientists may say something about the relevance of the debates). They are at the heart of some of the more important discussions in science today, and nowhere is that clearer than in genetics and evolutionary biology. That's because the empiricists' belief that nature was law-like and that empiricism would lead to discovery of those laws of Nature formed the conceptual environment of Darwin and Mendel, and thence to the present when many if not most biologists routinely invoke what amounts to be strong, law-like deterministic views of genetic causation and, connected with that, evolution. We'll discuss these issues in Part II of this series.